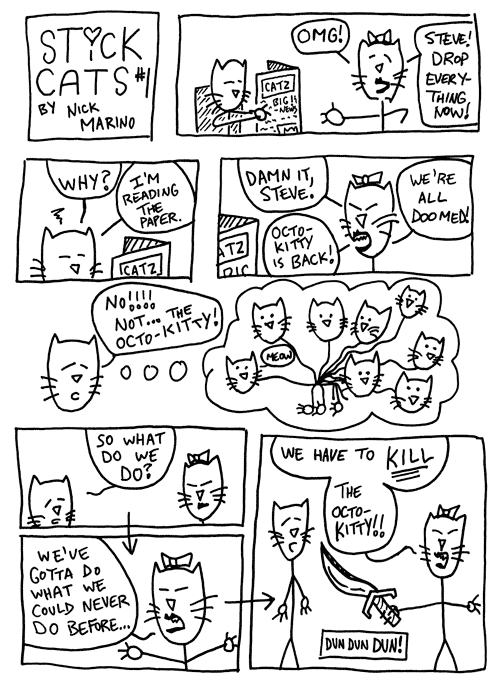 This is the debut installment of Stick Cats. I don't have a big plan for it. Nor do I have anything extra special to share with you. I'm just gonna keep posting a new page of Stick Cats every Monday Wednesday until I get bored with it. First visit to your site. Nice. Really nice. Very nice. I look forward to navigating through the web pages of your mind ! Hey, it'll keep me out of trouble. For dog lovers could you do something with "Dog Bones". "Bodies of bones with heads of dogs". Starring "Bob". I'm just saying. Visit my lame attempt at youtube http://www.youtube.com/watch?v=u8JaErwgqKU Kick A** Jets. Hi Uncle Frank. Thx for checking out Stick Cats. Nice slideshow skills there in that jet video. I never knew you were such a fighter jet fanatic.